This mission—Iridium-7—was the second in a global launch double feature as less than 15 minutes before, an Ariane 5 rocket launched from South America with four Galileo navigation satellites. Despite being second to launch, however, the Falcon 9 was first to complete its mission, deploying its payload just over an hour after taking to the skies. The 10 Iridium NEXT satellites on the top of the Falcon 9 were sent on their way at 4:39 a.m. PDT (7:39 a.m. EDT / 11:39 GMT) July 25, 2018. The Block 5 variant of the Falcon 9 rocket lifted off the Vandenberg’s Space Launch Complex 4E (East) and should leave only one more flight to complete the planned 75-satellite constellation. SpaceX utilized a fresh Block 5 Falcon 9 to carry out this mission. The 230-foot (70-meter) tall two-stage Falcon 9 is fueled by a mixture of liquid oxygen and rocket grade kerosene. After a nominal, though foggy, liftoff, the vehicle thrusted skyward and toward the south over the Pacific Ocean. Just 2.5 minutes after launch, the nine Merlin 1D engines on the first stage shut down as planned and the first stage separated from the second stage. In a fast-paced sequence of events, the first stage immediately pitched over to prepare for a brief “boost back” burn to shave off some of its velocity to line itself up for a landing on the drone ship “Just Read The Instructions” down range in the Pacific Ocean. A second later, the second stage’s lone Merlin Vacuum engine ignited to continue ascent toward orbit. Finally, three of the nine first stage engine’s re-ignited to perform the brief boost back burn. Once on its own, the second stage with its 10-satellite payload continued climbing toward a parking orbit. Some three-minutes, 11 seconds into the flight, the payload fairing—the nose cone of the rocket that was used to protect the spacecraft from the thick part of the atmosphere—was jettisoned as it was no longer needed. After burning for about six minutes, the second stage cut off, having reached its preliminary orbit to begin a 43-minute coast period. Meanwhile, the first stage continued on its trajectory toward Just Read The Instructions. At 5 minutes, 39 seconds, it performed a three-engine entry burn, which further lined it up with the drone ship and helped cushion its reentry into Earth’s atmosphere. According to SpaceX’s John Insprucker on the company’s webcast, this was expected to be the toughest landing to date for a Falcon 9 first stage as the sea-state where the drone ship was at was rough and cross winds were high. However, upon performing its landing burn the stage touched down nominally with the weather appearing to have no major effect on the booster. Back in orbit, at 51 minutes, 28 seconds, the second stage’s engine restarted for a brief nine-second burn to circularize its orbit. About five minutes later, the 10 Iridium NEXT satellites started deploying one at a time. At one hour, 11 minutes the 10th spacecraft was deployed, concluding the Iridium-7 mission. Iridium NEXT is designed to replace Iridium’s current “legacy” fleet of satellites, some of which have been in orbit since 1997. Some $3 billion in funds have been allocated to produce 81 satellites. Sixty-six of these spacecraft will make up the operational constellation with the nine spacecraft serving as on-orbit spares. The remaining six satellites that are not in orbit will serve as ground-based spares. The final Iridium NEXT flight, Iridium-8, is expected sometime in the third quarter of 2018. Over the course of the coming weeks and months, the Iridium-7 satellites, much like the previous 55, will each be checked out and moved to a location to replace one of the legacy satellites. 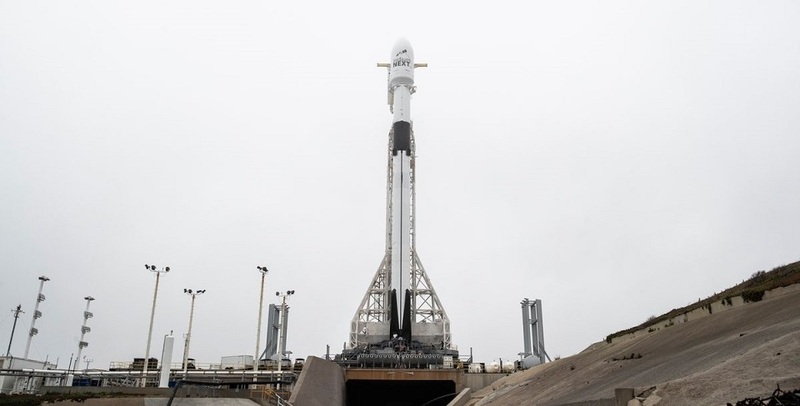 The July 25 launch marked the 14th flight SpaceX has carried out in 2018 from its facilities at Vandenberg as well as Cape Canaveral Air Force Station’s Space Launch Complex 40 (SLC-40) and Kennedy Space Center’s Launch Complex 39A in Florida. It was originally, slated to take place on Friday, July 20. However, SpaceX requested more time so as to ready the Falcon 9 rocket for flight. SpaceX’s next mission is scheduled for Aug. 4, 2018, and will see a fresh Block 5 Falcon 9 launch the Merah Putih spacecraft from SLC-40 on behalf of Telkom Indonesia. Liftoff is currently anticipated to occur at the opening of a two-hour window starting at 1:19 a.m. EDT (05:19 GMT).